Can someone please tell me what the hell is going on in Canada? It seems to be a golden era for music of the Canuck variety. Arcade Fire, New Pornographers, Constantines, Stars, Destroyer, Do Make Say Think, etc, etc, etc. Of course the veritable genius of the Wolf Parade boys (I do believe Spencer and Dan are forbidden to write any songs that don't reek of greatness). 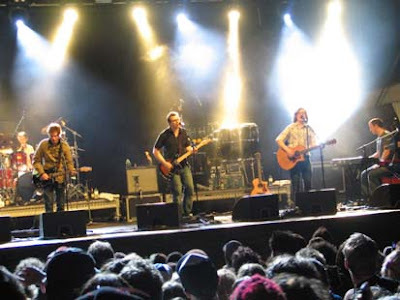 Then you have the whole Broken Social Scene collective. When I was being transported into Nirvana at their Metro show last year one of the things I remember was being so impressed by the guitar virtuosity of Andrew Whiteman. 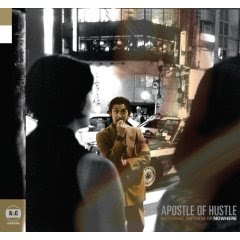 His band Apostle of Hustle (which is completed by Julian Stone and Dean Brown) have recently released their second album "The National Anthem of Nowhere" which follows 2004's "Folkloric Feel". And it is a fine release indeed. Now I believe Andrew Whiteman has Cuban blood in his ancestry and has spent quite some time in the Caribbean nation and you can feel the affect here. In fact two tracks "Rafaga!" and "Fast Pony for Victor Jara" are sung entirely in Spanish and give this album a really different flavour. Variety is probably the key word here. The record swings between its Cuban roots, its Canadian passages of aural assaults and moments of pop fuzziness. Other words I could use in description would be elegant, sumptuous, inspiring and delightful. The album opens with a buzz saw of a track in "My Sword Hand's Anger", which gives Mr Whiteman the opportunity to display his considerable talents with the guitar. The title track is also quite epic with its pulsating lines and drop dead middle section which echoes DMST. "Haul Away" and Cheap Like Sebastien" are other tracks that have me rocking, whilst "Justine, Beckoning" is all pop goodness. There are also other more languid songs which create an atmosphere of tranquility. There is a multitude of players on this album, including part time BSS's Evan Cranley and Lisa Lobsinger, which gives you a well rounded sound ideal for dancing around to or just good to lie back and chill out with. This will become one of my favourite releases of 2007. You can purchase now from Arts and Crafts. This band is quite good I believe. Please tour here, Win. Recorded recently at Culture Shock Festival, Bloomington, Indiana. A new song "Pier" also known as "Burning Out Your Eyes". Seriously has Spencer Krug ever written a bad song, the answer is no if you are wondering. Conor Oberst is now 27. After a succession of brilliant recordings he now brings us "Cassadaga". Gone is the boyish, fiery angst and in its place is a new found maturity. Does it make for a truly great record, probably not. Does it make for a satisfying listen that will grow with time, I believe it does. Bright Eyes is now Conor, long time producer Mike Mogis and Nate Walcott, who is responsible for the string arrangements. However once again we see a multitude of collaborators including talents such as Gillian Welch, M. Ward, David Rawlings, John McEntire, Janet Weiss and Maria Taylor. I came to the music of Bright Eyes before I knew anything about his image as a boy genius who some people liked to label whiny or emo. I was just stunned by the raw passion and songwriting talent on display on "Lifted..." and when I bought "Fevers and Mirrors" I was converted to the talent of the Omaha, Nebraska songwriter. "Cassadaga" opens quietly with the gentle "Clairaudients" before giving way to the stand out track "Four Winds" a rousing, swinging, joyous tune that is hard to resist. Its a lyrically complex song that seems to me to be about a call to the end of a multitude of religions and a fresh start for all. Well that's what I got out of it, plus the strings are sensational. Other stand out songs include "Hot Knives", a beautiful, pulsating song with great back up vocals from Rachel Yamagata. In the words of Conor from NME, "Hot Knives is a song.. uhm, sort of about a woman that kind of discovers that her life is a sham and can't really exist in her reality any longer and has to transform completely into a new, uh, species. It sounds crazy, but it's not that crazy. It could happen to you, too", "Classic Cars", which has a real country feel and features the wonderful Gillian Welch. I love the closing line "And never trust a heart that is so bent it can’t break". Also to savour are "No One Would Riot For Less", a song about love in a world gone mad which builds slowly and has an ethereal feel and "I Must Belong Somewhere", an epic song with wonderful imagery and a cry out for finding your place in the world. 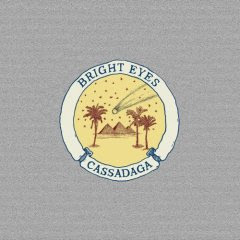 If you are a Bright Eyes fan I believe you won't be disappointed by "Cassadaga". Whilst it contains a couple of lesser tracks, the highlight songs show Conor hasn't lost his ability to write beautiful melodies and vivid lyrics. It is a beautiful sounding recording that displays a maturity leaving behind some of his more fiery earlier work. It is an assured and accomplished recording. The "Four Winds EP" is worth getting as well. It contains 5 new songs not included on "Cassadaga" which I believe are every bit as good as some of the "Cassadaga" tunes. Especially "Smoke Without Fire" (featuring M. Ward) and "Tourist Trap", a song as fine as any tune Mr Oberst has written. On a wet and rainy Anzac Day, what better way to spend the day then listening to great local music. This is what Wednesday's Essential Festival provided. Spread over 3 stages at the Gaelic Club and the Madison Hotel and running from noon until midnight and only $38.50 you certainly received value for money. Hot young things The Seabellies were first up and unfortunately I only saw their last 2 numbers. But I was certainly impressed. Their sound, with a multiple of instruments is big and bold. I will certainly make a point of trying to see them in the future. After that I watched a trio of bands that had varying effects on me. 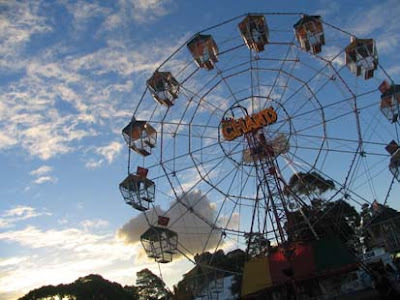 Sydney's Soft Tigers have been receiving a lot of praise and it is well founded. I think their sound is hard to pin down as they step into many genres, sometimes in the one song. But I really admired their efforts at being experimental and daring. Some of the songs were a little uneven but I could hear some great ideas that I think in time will bear fruit. Definitely will watch their progress with interest. Next up were The Hate Game and Flamingo Crash. Now both these bands have a full on sound that feature heavy drums and a big bass sound. They are both talented at what they do, but I failed to get terribly excited by the sameness of the material. I went searching for something that would feed my soul better and I found it in the shape of The Waysiders playing in the tiny makeshift stage in the Madison Hotel. These four young lads really impressed. Sounding like a cross between Pavement and Arctic Monkeys, their music was rocking but intelligent. They had more hooks then you would find on a fishing boat and were very tight. I might stand corrected but I don't believe they have anything recorded, but I would be very keen to see them again. 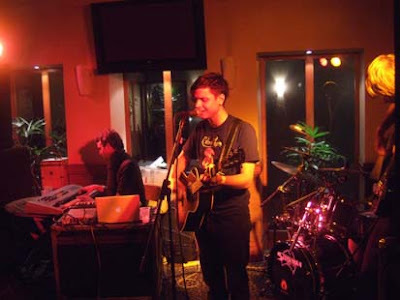 My only trip to the small stage at the top of the Gaelic Club was to see everyone's live favourite The Paper Scissors. And despite practically non existent lighting and a very muddy sound they delivered again. Opening with my favourite "Vaudeville King" and closing with "We Don't Walk" they had everyone rocking. Get these boys a bigger audience! After a respite for dinner I ventured upstairs to the Madison again to see Laura Imbruglia. Whilst not memorable her blend of punk/folk (labels can be hard) was pleasant enough. The next two acts (pictured) were the highlights of the day. I had seen Melbourne outfit Whitley support Calexico back in February and was mightily impressed. Their performance was even better this time. 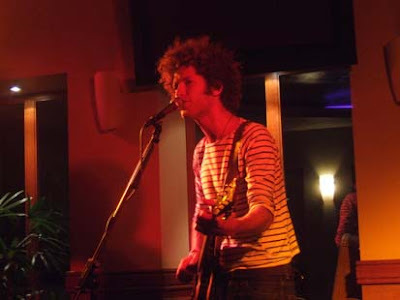 Playing a blend of country/rock/folk, Lawrence Greenwood's resonant, soulful voice was very impressive. There is a beautiful sparseness about their music, which really hits you in the heart when you listen. Their cover of Bjork's "Hyper Ballad" had me filled with awe. Their EP is well worth tracking down and I look forward to a full length album in the future. Old Man River was next and their set was superb. Ohad Rein's project straddles many genres, going from summery pop to soul to folky ballads to 60's like jams. A really tight 3 piece the live setting is perfect for them as they expand and totally blow up their recorded sounds. At times the sound was foot to the floor guitar heroics before they pulled back to the singalong closer "L.A." A very pleasant surprise and a band that lives to play live. The night ended for me with Sydney's finest Dappled Cities Fly, every one knows how good they are and its a statement of fact that they always bring the goods. I was really pleased to hear them close with "Within Hours". So a really fun day, there was a nice friendly vibe all day, lots of good young talent was on display and I certainly received value for my money. Plus I met Geoff again and said hello to Ro for the first time! This news saddened me greatly today. 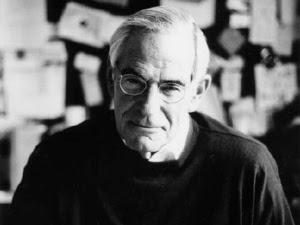 David Halberstam died in a car crash today just south of San Francisco. We have lost a giant of the literary world. Mr Halberstam covered topics as diverse as the Vietnam War, the Civil Rights Movement and sports. In 1964 he won the Pulitzer Prize for his coverage of the Vietnam War. Born in New York in 1934, his career spanned over 50 years. In fact he was researching a book on American Football at the time of his passing. So not only did we lose the opportunity for many more wonderful books, but by all accounts we lost a man who was regarded as erudite, compassionate, giving, steadfast and intelligent. Some of his greatest works were "The Best and The Brightest" (Vietnam), "The Powers that Be"(Nixon) and "The Children" (Civil Rights Movement). But for me I absolutely loved his wonderful books on sport. I love American sports, particularly baseball and his writings were always engaging, insightful and managed to not only bring a human element to scores and stats but place the sports events in the context of the happenings of society at the time. Two books he wrote on basketball that I loved were "Playing for Keeps" (Michael Jordan) and "The Breaks of the Game". But my two favourites were "Summer of 49", which chronicled the pennant race between the Red Sox and the Yankees and the great rivalry between their legendary champions Joe DiMaggio and Ted Williams. This is more then a book about sport, it manages to become a snapshot of postwar America and its hopes and dreams. 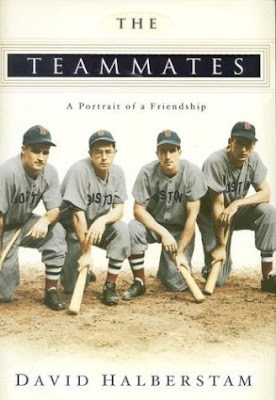 But my absolute joy is "The Teammates", a riveting and moving account of the friendship over a fifty year period between 4 Boston Red Sox greats, Ted Williams, Dom DiMaggio, Johnny Pesky and Bobby Doerr. This is a true testament to everlasting friendship between 4 men of disparate backgrounds. Some people like to belittle sport as little more then a frivolous past time. But I ask you, imagine the joy that would disappear from our life if sport left us. I believe that baseball is the most beautiful, graceful and aesthetically pleasing sport there is and when words as fine as David Halberstam's report on it our lives can only be enriched. A quote I always love that came from the mouth of legendary basketball coach John Wooden goes something like this "Sport doesn't build character it reveals it". David Halberstam, we will miss you. 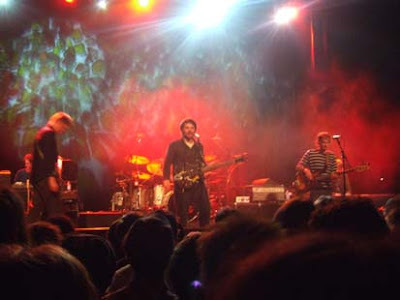 A little bit of Wilco from Saturday night at the Enmore Theatre. Jesus, etc. Just sublime, wasn't it! You still love rock and roll? I will never forget this. A great band, on top of their game playing one of my favourite songs of all time. This song sent shivers down my spine, just unrivalled greatness. When Jeff yells " I know you've got a God shaped hole", OMG. 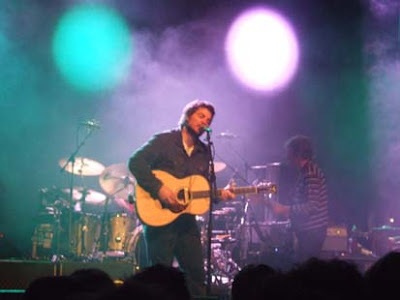 -Jeff Tweedy gently saying "Hello" during "I Am Trying to Break Your Heart"
-The sheer guitar pyrotechnics during "Spiders (Kidsmoke)"
-Getting the whole audience to yell their lungs out in "Kingpin"
-Jeff punching the air when he sang "A Ghost is Born" during "Theologians"
-Just the damn hummability of "Hummingbird"
"You could see people shake their heads in wonder; others had eyes fixed on the stage, smiles spreading, everyone thinking the same thing: "Damn, that was incredible." -quote from an excellent SMH review you can read here. You Ain't No Picasso has new Sunset Rubdown songs here. They were recorded at Lee's Palace in Toronto on 12th April. Spencer Krug can seriously do no wrong. Please tour here Spencer, and bring Dan with you. 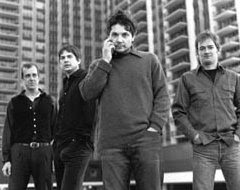 Vague Space has made a list of the top 25 "Wolf Parade collective" songs. And its pretty much spot on in my opinion. Can music reach a perfect apex? Can something be so good, so joyous that you are left feeling completely satisfied. Are there moments in time that when they end you want them back again. What if a band that you love gives you everything you require and adds a few extra layers of ecstacy. Well if you saw Wilco at the Enmore Theatre Saturday night in Sydney you will know what I mean. Wilco came, saw and conquered. I have seen them before, but only in festival situations where they play shorter sets and amid various distractions. Last night was the first time I have seen them perform in their own right. Sublime greatness is what I witnessed. They have such a vast and excellent catalogue that you will never hear every song you would love, but I have no complaints. Of course "Sunken Treasure" would have sent me into Nirvana. But I kinda didn't expect it. "Heavy Metal Drummer" and "Ashes of American Flags" would have been great too, but what was heard was pretty close to perfection. They opened with "You Are My Face" off the upcoming "Sky Blue Sky". In fact they played four new songs, all sounding great, especially the Beatles-like "Hate it Here". "What Light" was one they didn't play which I thought they would. Of course their monster records "Yankee Hotel Foxtrot" and "A Ghost Is Born" received heavy coverage. "Jesus, etc." was serene, "I Am Trying to Break Your Heart" was sublime, "Handshake Drugs" was inventive and really rocked, "Theologians" was devastating (when Jeff screamed A Ghost Is Born I almost melted), "Hummingbird" was sheer beauty and "At Least That's What You Said" flattened me with its guitar wizardry. They delved further back into the past with songs off the "Mermaid Avenue" sessions including the divine "California Stars" and "Airline to Heaven". And "Summerteeth" got a look in with the fist pumping "Shot in the Arm" and the heartbreaking "Via Chicago". So many other positives, the sound was great, lighting was just right and the band were just super tight. Glenn Kotche attacked the drums with admirable fervour. John Stirratt, Pat Sansone and Mikael Jorgenson displayed their excellent musical skills. Nels Cline was simply incredible, his guitar playing ability almost other worldly. And it always seemed when his guitar pyrotechnics would go overboard the band would all come together again. Oh and some guy named Jeff Tweedy was pretty good. A voice of such character and depth, he was in excellent form. His guitar work was outstanding and when needed to, he communicated with the audience with great warmth, humour and generosity. He cracked wise about Tasmania and Queensland, said he was pleased to be playing in "Steak and Kidney". He got great crowd involvement in "Kingpin" getting everyone to imitate pirates at the end of the song. Two encores, well over two hours, the band seemed to feed off the crowd's delight playing with passion and joy. Oh, and the second encore. Devastating, sorry I am running out of adjectives at this point. They played "Misunderstood", enough said. To say I was pleased would be a massive understatement. Then they completed the night with an incendiary "Poor Places">"Spiders (Kidsmoke)". I was witnessing greatness. Thank you Wilco. And thank you to the crowd, who were respectful, involved and gave this great band an environment to excel in. To make the night even better, Augie March's Glenn Richards performed an excellent set before hand. Accompanied by Kiernan Box on harmonica, his powerful voice rang through the Enmore giving us a marvellous appetiser to the main event. Playing a selection of Augie March tunes including "One Crowded Hour", I thought the songs sounded better then when played in full band mode. Definite highlights were two covers, "A Rainy Night in Soho" (The Pogues) and "Ohio River Boat Song" (Palace Music). Anytime I can hear Will Oldham written music is always a pleasure, so well done Mr Richards. If you have a back catalogue as large as Wilco I guess its hard to play songs that will please everyone. But these 2 shows look like they played a good selection of songs I would love to hear. Looks like Brisbane got 4 new songs and Melbourne 5. Obviously a fair bit from YHF and AGIB. No Misunderstood or Sunken Treasure from Being There, but they played Kingpin both nights. Please play Misunderstood, Wilco. Only one song from Summerteeth for both nights. Interesting they played a few songs from the Mermaid Avenue sessions, I definitely wouldn't mind hearing California Stars though. Did anyone go to these shows or the second one in Melbourne? 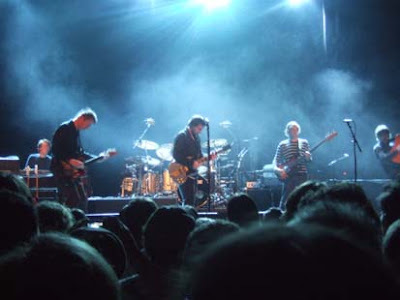 A taste for those who haven't seen Wilco yet on their Australian tour (me!). Jeff seems in good form too. Do you still read magazines in this wired age? I do. Its nice to sit in a comfortable chair and read well informed articles. Well my subscription to Under The Radar is treasured and I always look forward to it arriving in the mail. Issue 17 just arrived and there is plenty of goodness. 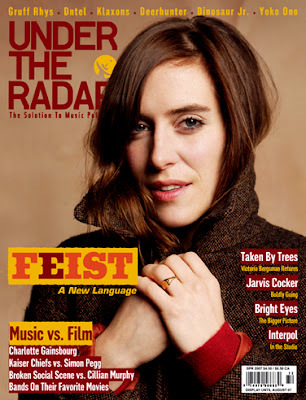 Yes that's the lovely Feist on the cover and as you can see there is plenty to read inside. Articles on Bright Eyes, Interpol, Jarvis Cocker, Dntel amongst others. There is a great interview between Irish actor Cillian Murphy (a big Indie music fan) and Broken Social Scene's Kevin Drew. Exciting news is that Kevin Drew has a solo record coming out later this year. But It's no stripped back acoustic effort, its full on BSS style goodness. There are CD reviews of new releases by Bright Eyes, Bill Callahan, Frog Eyes, Kings of Leon, The National, Voxtrot, Wilco plus many others. If you subscribe you also receive a free CD. This is not a paid announcement, It's just my favourite mag. Amie St is a great idea. This site is an independent music store where you can buy music. All music is DRM-free and free of cost to start. The price is determined by a community responsive model so the more times an album/track is bought the more it costs. Anyway check it out. 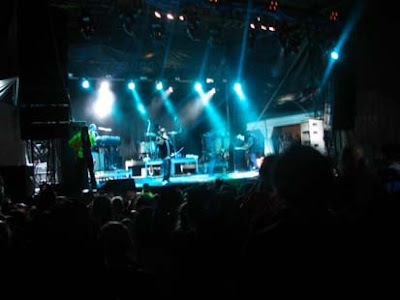 Splendour in the Grass 2007 lineup was announced today. Tickets go on sale Monday May 14 at $185!!!!!! Seems pretty expensive when for my money the only must see act is The Hold Steady. Although The Shins and Dirty Three are always excellent value. For my taste it seems a little too UK-centric. 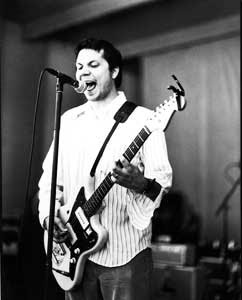 Only 3 days until WILCO. Recorded two days ago in Ontario, Canada. "Pioneer", a new song from Interpol. The chances of you reading this are as remote as me listening to commercial radio. However I am so excited that you are bringing your band to Australia. I am seeing you in Sydney this coming Saturday night. So I would like to propose to you my dream set list that I would dearly love to hear at the Enmore Theatre. Now of course I expect, know and hope you will play 5 or 6 new songs, so feel free to throw those in wherever you see fit. I have allowed two encores, I think the second one will leave everyone dancing into the night. However If you feel like playing longer that is fine with me. Also I will be happy with whatever you choose to play if you don't like my set list. For those Wilco fans out there, what would you like to hear? In the next week or 48 expect me to post on Handsome Furs, because I am totally blown away by Plague Park. Here is "What We Had" live. There is a very good chance that a Wolf Parade member will have my album of the year for the third year in a row. 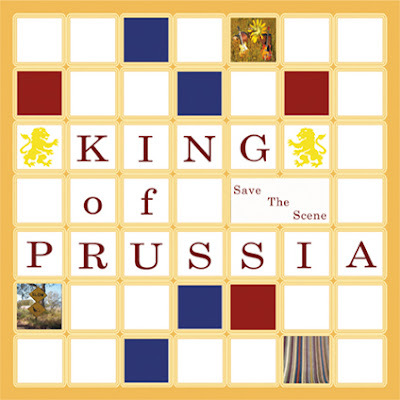 "Save The Scene" is the debut album from King Of Prussia, who call Athens, Georgia home. Consisting of only 7 tracks, it nonetheless is an extremely promising debut full of catchy pop, delightful melodies and singalong choruses. It opens brightly with the swinging, melodic "Spain In The Summertime" before coming to the rollicking good time feel of "Misadventures Of The Campaign Kids". Highlight song for me is definitely "Cheerleaders", an effortlessly good song which has some great slide guitar to push it along. Try to resist this one. The closer "Physics Never Stood A Chance" impresses as well with its piano lines and hushed tones. Although self released this album doesn't have an amateurish feel. It's confident, bold and has high production values. A band to keep an eye on for sure. You can purchase "Save The Scene" from their MySpace. I have been listening to "Because of The Times", the new one from Kings Of Leon a fair bit lately. At the moment I would say it doesn't have the killer songs that "Aha Shake Heartbreak" contained but its a very good listen indeed, despite this review. 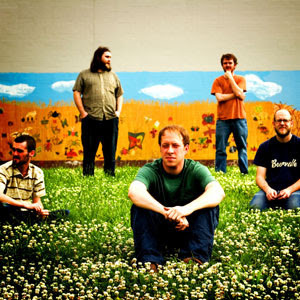 Annuals are a band that really caught my attention in 2006 with their wonderful debut "Be He Me". At the moment they are touring the US and are keeping a video diary. Part one can be viewed now at Pure Volume. Its pretty obvious that Pavement were musical perfection. Well here is an excellent write-up on the best 20 Pavement songs ever. I'm still going for "Zurich is Stained". New song from Sufjan Stevens. What's not to love! Imagine you find yourself in the most idyllic place on Earth. Perhaps a crystal clear swimming pool on a perfect day adjacent to a spectacular coastline. You hover over the edge of the pool, waiting to dive in, you dive in and you find bliss. Well experiencing "Person Pitch" is similar to this experience. Panda Bear's newest creation is musical bliss. I honestly find it hard to stop playing this album. 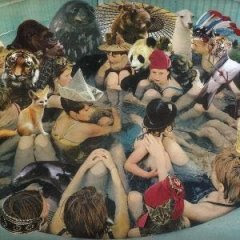 For those that don't know, Panda Bear is Noah Lennox, one of the creative forces behind the musical dynamo otherwise known as Animal Collective. His music is all beautiful melodies and the ability to create a space where you can lose yourself from any anxieties you are feeling. Noah recorded and produced his latest work in his new place of abode, Portugal, and straight from the opening track "Comfy in Nautica" you know something special is coming your way. A simple chant, the vocals just soar above a constant rhythm. "Goodness is having courage, courage to do whats right" sings the Panda. I agree. We then take a slow diversion through "Take Pills", a slow churning song which builds and builds before it leads us to epic song number one, "Bros". What can one say about this song, a 12 minute journey through pop wonderland. Panda sings "Hey man what's your problem". The problem is, this song has to end. Its been noted before, but the Brian Wilson comparisons really shine through here. All summery and delicious vocals and a delightful melody which builds and builds in intensity. About 8 minutes in, the instrumentation will have you shaking with delight. Like any Animal Collective creation there is always a track that tests the patience. Here I find it is "Im Not" which a little too drone like, but thankfully "Good Girl/Carrots" sweeps you away straight after. Splitting your brain open with a tomahawk approach its beats will lift you up and have your head spinning and then 4.30 in, the heavenly vocals float by and you can just lie back and relax and be comfortably transported to a place of serenity. A simply stunning song. Then "Search for Delicious" and "Ponytail" finish off things nicely. Two shorter songs but still little packets of sweetness. This album is truly creative and is to be applauded and enjoyed for its daring and sheer beauty. Its gladdens my heart to know that human endeavour can create something this wondrous. Its available for purchase at Paw-Tracks or Amazon. Bridezilla are young, so young. But what talent. Their performance in The Tin Shed (great venue) was exciting and makes me think they have a very big future. Josh the drummer is the oldest at 18 and provided a great back beat, along with Pia on guitar. Holiday on vocals and Millie on sax were great as well, but the element that sends this band into perhaps rising above the average is Daisy on violin. 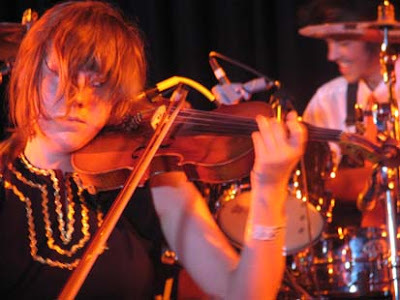 Now I love a good violin player and she is excellent, providing that extra special touch to every song. Their music has a great momentum, building epic crescendos which paid off on most songs. So refreshing to see young musicians pushing their boundaries and trying to create something a little special. 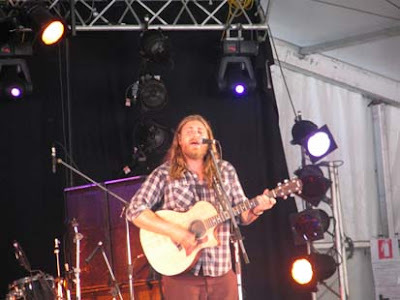 I wish I had seen all of The White Buffalo's set, what I did see was truly wonderful. A giant of a man, his voice would level small countries. Playing a blend of folk and country, he really is quite a talent. His songs were full of passion and fire as well as having the scope to be alternately gentle and touching. He closed with the Jimmie Rodgers country classic "Blue Yodel #1". I think I need to check out his show at the Hopetoun Hotel on Thursday night. I think I have seen Gomez 5 times previously but they never, ever disappoint. Just mature, talented, dedicated professionals. They had the crowd jumping for an hour playing classics like "Fill My Cup", "Revolutionary Kind", "Hangover", "Shot Shot" and of course "Get Myself Arrested" and "Whippin' Picidilly". The highlight however was definitely a blistering version of "How We Operate" which was just great. Gomez were definitely my highlight of the day. I just wish some clowns hadn't decided to throw straw in the air, which set off a straw throwing frenzy. Hey it was funny for 5 minutes but the joke wore thin quickly. I was quite excited to see The Roots, but I left a little disappointed. I'm not a true fan of the rap/hip-hop genre, but what I have heard of The Roots made me believe they were a cut above the average hip hop performer. Now I do like that lyrically and thematically they strive for something intelligent and they are definitely talented musicians but at the end of the day I find the rap genre narrowed in substance by its reliance on beat and not melody and song structure. So maybe rap and I aren't going to be friends. Although I was a big fan of Public Enemy and De La Soul back in the day so maybe I will have to revisit my old records. So I had a very enjoyable day, saw I few different styles of music and thankfully the rain mostly stayed away. The venue is excellent, easy to get around, never felt crowded and I love the vibe of the old Newington Armory buildings. For me the festival had an eclectic lineup with a pretty decent slice of Australian bands. I would just have like to have seen an injection of some never seen here North American bands, like a Catfish Haven, Annuals or Dr Dog or something along those lines. But I think I would definitely return next year if the lineup gets me excited. I have more photos of the day at my Flickr. The Fader is a New York based music magazine that publishes 8 issues a year. Covering a wide and diverse range of genres, the latest issue has two artists making a statements musically in 2007. 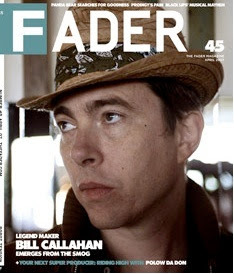 Bill Callahan (cover star) and the breathtaking genius that is Panda Bear. They do excellent podcasts with each issue. You can download the latest one right now. I mentioned the other day bands you love but don't get the acclaim you know they deserve. Well what about those bands you overlooked yourself. Sorry, but I am guilty of overlooking The National. A lot of people loved their 2005 release "Alligator" but it didn't do a lot for me. Recently it seems a lot of blogs are raving about "Boxer" their upcoming May release. "Fake Empire" was released for preview and I loved it. So I went back to "Alligator" and something clicked. I am now realising its beauty and majesty, especially the second half of the album. Now bring on May and "Boxer". I know its leaked but I'm going to wait until the CD is released. You might have figured this out by now but I have quite an obsession for all things Wolf Parade, well I meant to link to this a few days ago. Better late then never. You Aint No Picasso is easily one of the best blogs in existence. Recently 3 new Wolf Parade songs were previewed. Three New Wolf Parade Songs. 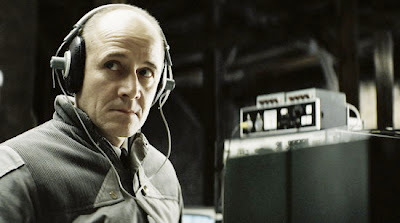 The Lives Of Others (Das Leben der Anderen) is a stunning film of great complexity and one that should be a must see for all lovers of cinema. It recently won Best Foreign Language Film at the Academy Awards and thoroughly deserved that honour. Set in the year 1984 in the former East Germany we are introduced to Gerd Wiesler (Ulrich Muhe) a seemingly cold blooded Stasi agent who lovingly spies on his fellow countymen for the good of the state. A stoic character, he is instructed to monitor Georg Dreyman (Sebastian Koch), a celebrated writer, who appears to be a loyal state subject. However the Minister of Culture suspects him to be a subversive character and instructs surveillance to begin. It is later revealed that the Minister has other motives for the operation. Dreyman's girlfriend, the actress Christa-Maria Sieland (Martina Gedeck) also becomes entwined in the intrigue as Wiesler develops a fondness for her which ultimately compromises his position. This film is a beautifully captured slice of history, a time when peoples' rights and freedoms were removed under the austere rule of a one party state. We see the effect on a population whose every move is watched as the basic rights to free speech and movement are ruthlessly taken away. This film has all the elements, part political thriller, part history lesson and most importantly, a fully realised human drama. This is no coldly played out exposition film, it is marvelously textured with superbly nuanced performances and richly rewarding in its conclusion. I believe it is a fine example of the ability of celluloid to capture the human condition with all its flaws and qualities. Do you need any more evidence that everything messrs Boeckner and Krug touches turns to gold? This is great and so is Plague Park. This is so funny! Do you know anyone like this? I would say that everyone has a band (or bands) that you hold dear to your heart. One that produces great music but somehow flies under the radar, escaping all the hype and acclaim you just know is going to someone less worthy. I have a couple that fit the bill, Aloha is one (such sweet music) and Minus Story is definitely another. Hailing from America's Midwest they make music which delights the senses and massages the heart. Fractured pop with a big heart if you like. All their back catalogue is worth checking out, but thankfully they have new music on the horizon. "Make the Dead Come" is a limited edition mini album coming out in 2 weeks. Containing 7 tracks, the band recorded it in between sessions for their new full length "My Ion Truss" which is due for release in June. Apparently there will be only 500 copies and you can order it from their My Space. If you go there now you can also hear "Stitch Me Up" from "My Ion Truss". All Minus Story albums are available for purchase from Jagjaguwar. Also out soon on Jagjaguwar is a new EP from Vancouver's Ladyhawk. Their debut album was a favourite of mine in 2006 and "Fight For Anarchy" is due out in May. They are currently recording a new full length due for release in 2008. Here is a track from the forthcoming EP. Anything remotely concerned with Wolf Parade excites me greatly, so I am looking forward to "Plague Park", due out in May. It represents the debut of Handsome Furs, a project between Dan Boeckner (Wolf Parade) and his fiancee Alexei Perry. Here is a track from the new album and I think it sounds pretty good, definitely has me intrigued about "Plague Park". I'm heading out to The Great Escape this weekend. Well only Sunday actually. I didn't go last year, so that's the main reason for going. I think the lineup is solid but not spectacular. I am looking forward to The Roots though, their live reputation is through the roof. Playing times are up now. On a somewhat related note there is a Great Escape festival just announced that takes place in Brighton, England over 3 days in Mid-May. The excellent lineup includes Annuals, Art Brut, British Sea Power, Elvis Perkins, Loney dear, Micah P. Hinson, The Besnard Lakes, Voxtrot, amongst many others. I now have "Person Pitch" in my possession. Panda Bear's Magnum Opus is definitely worthy of all the praise being heaped upon it. 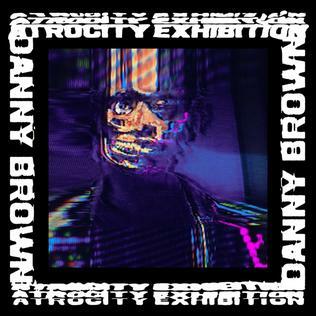 A complex, startling work, it reveals more with every listen. I hope to have a full review up soon after I fully digest it. 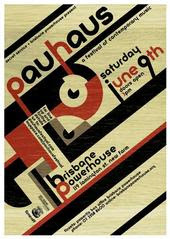 Pauhaus is a new festival to look forward to for those that live in the Brisbane area. The event will take place on June 9 as part of the relaunch of the Brisbane Powerhouse. The bands announced so far include The Grates, Expatriate, The Panics, Red Riders, Dappled Cities Fly, Macromantics, Bit By Bats, Whitley, Wons Phreely, Operator Please, Violent Soho, Yves Klein Blue, with more to be announced. Also it is an All Ages event, so plenty to look forward to. Tickets go on sale April 16 and cost $49.50. More info can be found at Pauhaus/My Space. I DO like their new album. But this is classic, classic, Modest Mouse. In fact its my favourite song by them. Oh, to have been at this show.